With Summer in “full swing”, it seems like we are grilling 3 or 4 times per week! 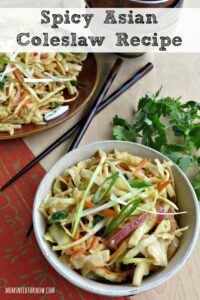 While we have our old “standby” sides (like my cucumbers and onions recipe or even my baked sweet potato fries), sometimes you want something a little different and this spicy Asian coleslaw is just that! 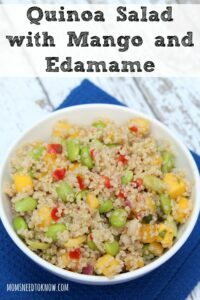 This quinoa salad with mango and edamame is another favorite of mine in the summer and takes just minutes to make! The peanut butter acts as both a flavoring and an emulsifier for the dressing but if you're allergic to nuts (or just don't love peanut butter), you could replace it with 2-3 tablespoons of any light-flavored oil. On the other end of the spectrum, if you really like peanuts, you can throw in some peanuts (whole or chopped) for some added crunch! Just 1/2 teaspoon red pepper makes this quite spicy. If you're sensitive to heat, I suggest starting with even less or none at all (although honestly? I usually add a little more than that, but we like things spicy in my house). You are going to want to make sure that you make this at least an hour before you want to serve it because you need time for the dressing to “break down” the cabbage so that it wilts a little bit! 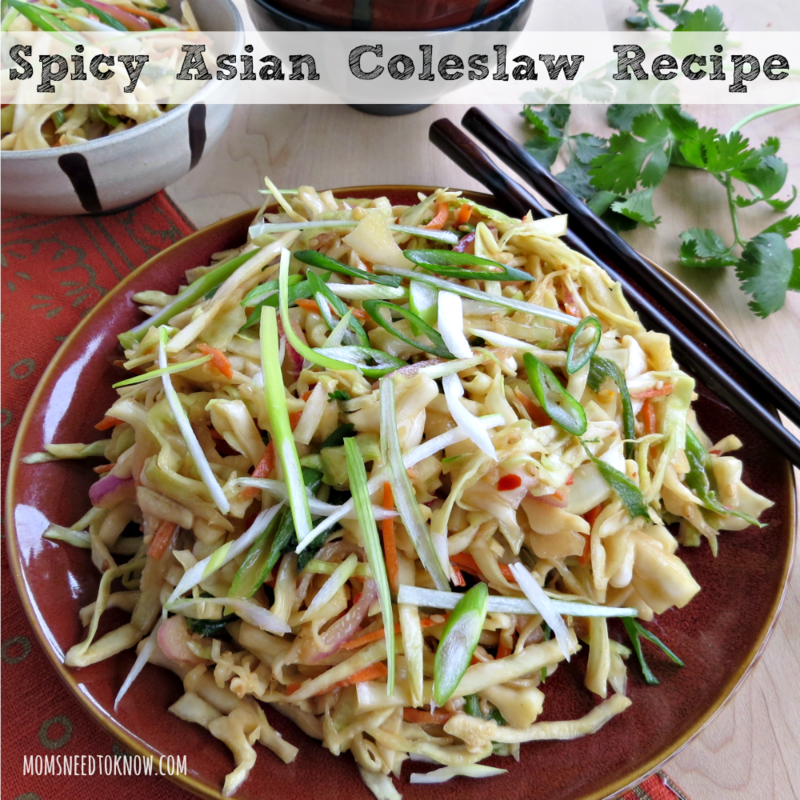 This spicy Asian coleslaw recipe is really delicious and easy to make. Serve it as a side dish or toss in some chicken or shrimp to make a complete meal! To shred the cabbage, trim the core off of the end so that it sits steady without rolling around. Cut in half vertically and then cut each half in half again to make quarters. Remove any remaining core and thinly slice to make long, thin strands. Set aside. In a large bowl, add all of the dressing ingredients and whisk to combine. Taste and adjust seasonings. If the dressing is too tangy, add a pinch of sugar to balance it out. At this point, you can also add more of whatever you like. If you like more soy, add it. More vinegar? Add it! The beauty of these kinds of salads is that you can make them to suit your own tastes. Once the dressing is done, add in the veggies and toss to thoroughly coat everything. Almost immediately, the cabbage will start to break down and wilt. Stir a few more times, cover and put in the refrigerator to chill for at least 30 minutes. If possible, give it a stir every 10 minutes or so. Before serving, taste and adjust the seasonings again and add salt and/or pepper, if needed. Serve with extra green onions on top for garnish. This looks delicious! Thank you for sharing your recipe with us at the Brag About It Link Party! Loving this twist on the usual cole slaw! I hope you can stop on by and share this or any other recipe with us on Five Friday Finds! Ooooh! This looks great. I pinned it and definitely have plans for this coleslaw in the future! Thank you so much for sharing with us at the Inspire Me Mondays Link-Up! I have a cabbage patch in my garden and I am excited to try this! Yum! This looks so refreshing and perfect to eat in our 90 degree weather. Thanks for sharing the recipe. Pinned. Omgosh, a coleslaw that doesn’t include any ingredients I don’t like! Yay! This sounds (and looks) absolutely awesome. Thanks for sharing your recipe with us at Merry Monday this week!